In Russia, the World Cup has started. A grandiose event, if for some reason, you did not manage to get to the stadium, then you, for sure, watch it on TV? Sounds logical. You can certainly go to the bar, but your liver doesn't have such resources for all the bar-matches. Therefore we invite friends home, and watch football on a large 55-inch TV, which you recently bought, with good color rendering and powerful speakers. A good TV does not have to cost 300 thousand rubles ($ 5.000). Although, personally for me, it was a surprise. They have lowered the price, and now you can take a good TV for a hundred thousand rubles. Not from China. It's real? It turns out that this is possible! Each major company seeks to cover as many markets as possible, presenting more affordable options. 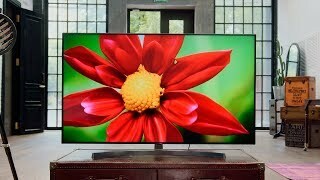 So the company LG did the same thing, one of the leaders in the market for the production of TVs, This year, it introduced an available LED Super UHD 4K TVs — SK8500.. There are three versions: 49, 55 and 65 inches. Today let’s take a look on the "golden" middle, on a 55-inch TV, which perfectly fits into any living room. Yes, and into the garage too. And in a small Vietnamese room, where even no toilet at all, but each of 10 people has an iPhone. So, no, it's more about India ... okay, stop! LG's premium TV line comes with “Signature” sign and all "tv boxes" are equipped with OLED-matrix. Here is a simple LED. The type of the matrix is TFT IPS. The exact size of the display is 54.6 inches (139 cm, in the international scale of sizes), aspect ratio 16 to 9, refresh rate 100Hz, resolution of 3840x2160 pixels or 2160p. That's right – 4К! This format is best suited for most of the currently available content, including tv-broadcast. It's time for TV series and films in 4K format. It's time to move on to this standard. Now it is obvious to everyone. To the abbreviation of that LG TV UHD added the word "Super". Not for nothing. In all there is a share of innovation. In this case — nanoparticles. Remembering the advertising of OLED panels, the first thing that comes to mind is pure black color in comparison with a conventional LED. They promise a deep black color due to the technology of Nano Cell, at which nanoparticles increase the quality of color transfer. Due to the same technology, the quality of the image under the corners does not change. You invited a bunch of friends to watch football and everyone will be satisfied, because at the corners the picture remains the same and skin color of Ronaldo and the form of the Russian national team will be of one shade. In addition, the manufacturer declares, that it is better not to sit down in front of the TV, but at an angle, so that the distortion of colors is less. It sounds strange, but it works that way. Another technology is full-matrix darkening. For some TVs, the backlight is located on the bottom or side, here it is in the whole matrix, naturally, but when you need a black color – certain areas of the screen are turning off, so soon the difference between OLED and LED TV will be minimal. I will tell you a secret, it is already minimal now. If you digress from soccer and think about your favorite films, then here there are a couple of features.. Novelty from LG supports many formats of HDR — Dolby Vision, Advanced HDR от Technicolor, HDR 10 Pro and HLG Pro. In other words, the color reproduction of films on the output will be exactly the one that was conceived by the creators. But how we do it in Mother-Russia? Go to Settings and turn off all these "improvements" and voila – we have a really good picture.. Which is thought of. This applies to any TV in principle! The next — is sound. The system 2.2 is used: two speakers and two subwoofers. The total power is 40 watts. The speakers are pointing down. Ultra Surround system. Supports Dolby Digital, DTS. The sound is not the best, not like the Signature-series, but in general, really good and loud! The TV has Bluetooth 4.2, so you can play music on the speakers from your smartphone. Or transfer the sound from the TV to the wireless speakers. The device can do this. The SK8500 works on the proprietary webOS Smart TV. The most convenient OS for TV has become even more convenient. It introduced the functions of a smart home and voice recognition. Switching modes, information about the weather, search the Internet, turn off the TV — all this can now be done by voice through the Magic Remote. If you lose or break the remote control is available to use it through the application on your smartphone. A couple of words about voice input – works surprisingly very quickly and accurately defines queries in Russian, and it understands everything well enough. It was strange for me to see it, but it's all true. - "Weather for tomorrow." Another cool feature — is the service "LG Plus channels" which gives you 200 federal, regional, foreign and thematic TV channels. You simply connect the TV to the Internet, and get the content, you do not need to buy a set-top box or mount an antenna. Plus LG promised that will give all the matches in the 4K HDR at the time of the FIFA World Cup!. In my opinion, sports bars also need to think about buying a similar TV. The quad-core processor responsible for the system’s stability and for preventing lags at the most crucial moment.. Designed specifically for TV — a7. It also processes voice commands. Well, everything works nice, so it's even hard to criticize at all. Forgot to say about the look of the device. Around the display a thin silvery aluminum frame, rear part is in black, here all the outputs are located – from HDMI to USB. Connection options both on the side and rear. Place the TV on a silver curved leg or hang it on the wall. Weight 17.2 kg. The leg is made mega-comfortable, 4 bolts for special fastening, which is inserted into the leg. This is a huge plus. What we have in total – a quality picture, with good color rendition, almost like the flagship models of LG TVs, 200 free channels, smart features, and minimalist design. The frames are thin, for real! All this can be bought for 110 thousand rubles for a 55-inch model. The 50-inch version is even cheaper – about 80 thousand rubles. Well, the maximum 65-inch model will cost for all 180 thousand rubles. In any case, it is still cheaper than premium TV models. 4K & amazing picture – I'll take it!.